This will only be a short post this week, not because I don't have a lot to say ( I always have a lot to say) but because I completely ran out of time to actually write the weekly round up. It's funny how I manage to get so busy this time of year, lots of outings, things on the calendar and even when I think I'm being really organised, I drop the ball with something. But I do think it's time to now mention the word Christmas. Who's prepared? Who hasn't even begun to think about buying presents, let alone wrapping any of them? I'm going to be a little bit smug now and say that I am almost finished. I've bought all of my presents and wrapped most of them too. I have ordered my Christmas meats and I even done my mum's Christmas shopping too, she now only has two people left to buy gifts for. Like I said, I really do like to be organised. Finally I got around to ordering my copy of the last instalment in Sarah J Maas's Throne of Glass series, Kingdom of Ash. 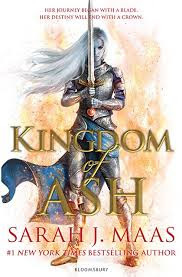 At a massive 980 pages long I'll admit that I haven't been able to finish it yet as I only began reading in Monday evening but I'm already over 300 pages in, it's as good as the other books and honestly I'm not quite ready for this series to end. Yesterday was the busiest day of my week. Firstly I took the kids to the cinema straight after school to see The Grinch. If you are looking for a family-friendly festive film then this is your one. It didn't disappoint at all. Lots of laughs and plenty of Christmassy feels. It was the perfect re-make for this movie. 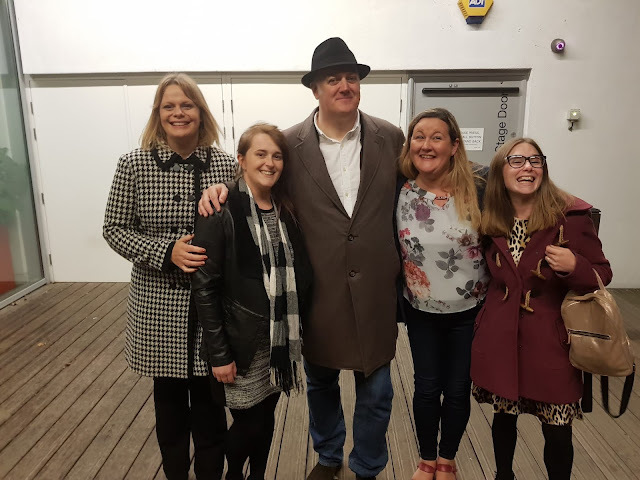 Then straight after the cinema, my husband picked up the kids and I was on my way to The Marlow in Canterbury to watch Dara O'Briain. He is one funny man but boy was I glad not to be in the front row. Two people were a 'little' late and lets just say one of them spent a lot of her time after looking at her feet in embarrassment. To make the evening that much better we even managed to get a picture with him at the end of the show. I've begun to hear my youngest practicing her lines for the nativity play. Being in year 2 means that this will be my last ever nativity to watch that has one of my children in it. I'll have to make the most of my god children after this! But for now my lovely six year old has been chosen to be narrator number 4 as she has such good expression when she talks. My only concern is how she's going to be able to talk into the microphone on the podium because she's so small I have a feeling she won't be able to reach it. I'm making changes when it comes to my work life. I applied for a job a few weeks back and last week I was offered the position. I've been reluctant to say a lot as I'm yet to sign contracts etc but I'm quite excited and wanted to share my good situation. We're all wearing dots today in honour of Children in Need. Cannot wait to watch it on the television later, have you all donated something? Like I said it's been a busy with lots of prior arrangements and things are no different for the weekend either. Tonight the girls have a friend coming for dinner and possibly sleeping over afterwards so the hubby is sneaking out to the pub. Then there's me again. I'm off out for dinner tomorrow night with old work friends. We try to get together at least once a year, normally twice, just for a good old fashioned catch up with some food and drink mixed in. What's everyone else's plans? I here it's set to get colder so perhaps some hibernation is in order.